DMG Productions explores the latest breakthroughs in transportation solutions. 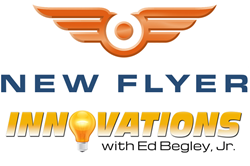 Innovations w/Ed Begley Jr., announced today that they will feature New Flyer Industries, Inc. in an upcoming episode, airing second quarter 2016 via Discovery Channel. Dates and show times TBA. This episode of Innovations will explore New Flyer Industries, Inc., leading manufacturer of heavy-duty buses and motor coaches in the U.S. and throughout Canada. Viewers will learn about New Flyer’s broad line of transit vehicles, as well as its reliable transportation solutions. Traveling to its headquarters in Winnipeg, Manitoba, and other production facilities, the show will educate on the innovation and excellence New Flyer provides to its customers, offering a wide range of products such as clean-running, fuel-efficient hybrid buses; zero-emission electric buses and trolleys; buses with alternative fuels, like hydrogen and CNG and clean diesel buses. The Company employs over 5,000 team members and is the largest transit bus and motor coach manufacturer and parts distributor in North America with fabrication, manufacturing, distribution and service centers in Canada and the United States. Through its Canadian and U.S. subsidiaries, New Flyer Industries Canada ULC and New Flyer of America Inc., the Company is North America’s heavy-duty transit bus leader and offers the broadest transit bus product line (Xcelsior® and MiDi® models), incorporating the broadest range of drive systems available, including: clean diesel, natural gas, diesel-electric hybrid, electric-trolley and now battery-electric. New Flyer actively supports over 42,000 heavy-duty transit buses (New Flyer, NABI and Orion) currently in service. Through its Canadian and U.S. subsidiaries, Motor Coach Industries Limited and Motor Coach Industries, Inc., the Company is North America’s leader in motor coaches, offering the MCI J4500, which is the industry's best-selling intercity coach for 11 consecutive years, and the MCI D-Series, the industry`s best-selling coach line in North American motor coach history. MCI is also the exclusive distributor of Setra S417 and S407 in the United States and Canada. MCI actively supports over 28,000 motor coaches currently in service and offers 24-hour roadside assistance 365 days a year. The Company also operates North America’s most sophisticated aftermarket parts organization providing support for all types of transit buses and motor coaches. All buses and coaches are supported by an industry-leading comprehensive warranty, service and support network. Further information is available on the Company’s websites at http://www.newflyer.com and http://www.mcicoach.com. For more information visit http://www.InnovationsTelevision.com or contact Eric Buckley at (866) 496-4065 x 817 or via email at eric@InnovationsTelevision.com.